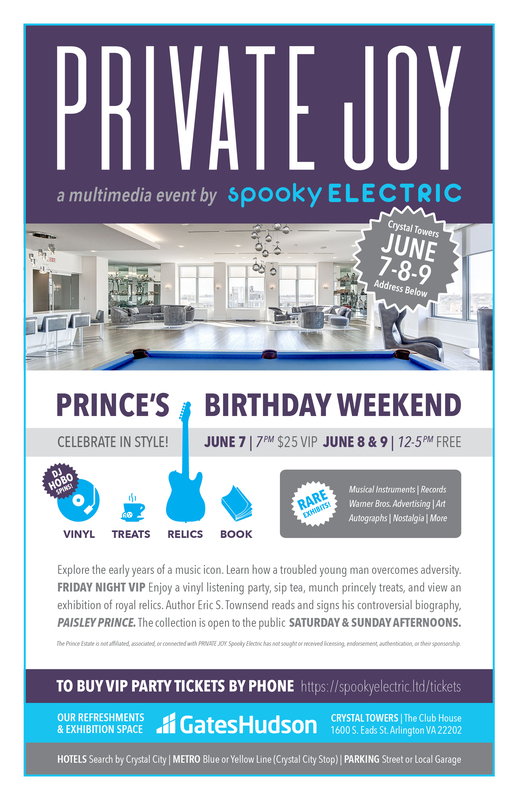 We honor the music icon on his birthday weekend with an exclusive VIP party (Friday, June 7, 7pm doors) and two open houses (Saturday & Sunday, June 8-9, 12-5pm). You needn’t be Prince fam to enjoy this celebration. We’ll have something for everyone! Celebrate Prince’s BDAY with us: June 7 (7pm doors). Tickets: $25. Limited to 150 attendees. Bob your head or cut up the floor as DJ HoBo spins Prince tracks vintaged 1977-1983. Delight in Prince’s favorite herbal teas, cookie recipe, and funky pancakes. Walk an exhibit of early Prince promo material, musical instruments, and other relics. Enjoy a reading from Paisley Prince and buy a signed copy from author Eric S. Townsend. Prince had friends in high places. Don’t be surprised if one or two crash this party.